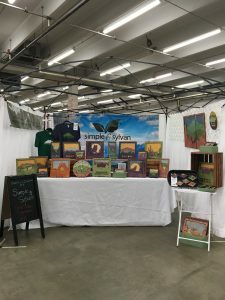 The first craft fair of the season was at the National Western Complex in Denver. The Denver Handmade Homemade was being held in tandem with the Alpaca show. I figured, the Alpacas needed to be trucked in somehow, and that with the live stock in and out of there, they would need to have some trailer parking to accommodate them. I called, and lo and behold, there was free trailer parking! I arrived, and the gentleman working the door pointed me to a back-in spot, well, that was interesting. After 10 minutes of getting it close, but not perfect, I was rescued by a man who drove tractor trailers, and boom, he guided me in like a champ. Just one more thing to practice. Turn the wheel the opposite way you want to tun the trailer. I generally will say I am pretty thrilled that I have been hooking and unhooking the truck and trailer from the hitch, and putting on and taking off the equalizer bars. Trains pass by the rig. I had a moment when first moving in about the water, nothing came out of the spout. I was so worried the tank had sprung a leak, as it should have been full when I pulled out of the dealer lot. So, yeah, ya gotta flip the switch to turn on the water pump… you want warm water? Flip the switch to the water heater. The free parking spot at the NWC does come with electric! 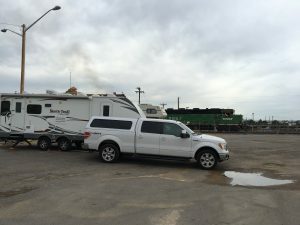 But, I also have an upfront and personal view of the train yard, and the RVs are a little close together, I fell asleep from the constant whine of a previous Husky next door. Not complaining for a free spot, and easy access to the fair. Waking up and waling to work was a pleasure! Booth set up for Handmade Homemade. Next stop, I am hoping to spend 4 nights at another State Park, Golden Gate Canyon, which at the moment is all first come first served. Hoping that people will roll out on a Sunday. Thursday I am dropping the trailer off at the dealer, as – gosh darn it – she’s sprung a leak, Captain (for real this time). The weekend I left the permanent residence, we had a snow storm. Last weekend of April and we had 3-4 inches, for Pete’s sake. With all the melting snow on the roof, some of it came in. I believe it was a pre-existing condition, as where the water is coming in there is a bubble in the cabinets that I missed in the walk-though. Thank goodness for a warranty. She’ll go in Thursday evening, and then they will go over the RV on Friday. I will set up the tent in the area, and then go to Graduation on Friday morning, then off to the dealer to hang out till they have figured out what’s going on. I will most likely have to take her back in a few weeks. I am also having them remove the banquet seat that is taking up way too much room for my needs. Such is life on the road.